Callaghan Roundup Temporary Holding December 2010, Sun J contractor. Standing water as temperatures dipped below freezing overnight and excessive debris in pens. On June 22, 2012 the Honorable Judge Howard J. McKibben issued an Injunction to pilot conduct in the Triple B Complex case that was amended following a decision in the Ninth Circuit on another matter by the same Plaintiff and attorney that changed underlying case law. Following a victory in the Ninth Circuit on Freedom of the Press issues involving wild horses Leigh amended the Complaint to address the new case law. The new ruling makes the parameters of the TRO permanent through the life of the Environmental Assessment, or 2013. The originally ruling and pending Amended Complaint were instrumental in spurring the BLM’s investigation that lead to the Triple B review that admitted much of the alleged conduct had occurred. That document promised a policy on the ground to address the issues of humane care. To date no policy has been issued by the agency. This is the history of the humane action case. While attending the Triple B roundup in Ely/Elko Nevada Laura Leigh became overwhelmed with the inappropriate conduct at the ongoing operation. Lack of water, hotshot use, brutal handling, to actually witnessing a helicopter come in contact with an exhausted animal was all documented. Leigh had been attempting to address these issue through reports, meetings, complaints, etc at prior operations to no avail. So she filed suit against the conduct and won a Temporary Restraining Order (TRO) that in no uncertain terms reflected not only public outrage with the conduct but the displeasure of a US Federal Judge. After the TRO, BLM admitted to the conduct and claimed to (vaguely) be crafting some type of (un)official policy that had no broad implementation or consequence for violation. Leigh took that action forward and amended her Complaint and showed conduct was continuing. At the next hearing the Judge recognized Leigh’s right to address the issue in Court and the validity of her documentation yet ruled that he could not act as BLM had not put the specific area back on the roundup schedule for tat year. He said Leigh would have to present evidence roundup by roundup. In a victory Leigh had in another matter the Ninth Circuit recognized that roundups are an inevitability and that conduct, if not addressed, was an appropriate claim. Leigh asked the Courts permission to bring this Humane Care case forward based on the Ninth decision and it was granted. Analysis of the BLM report. Wild Horse Education has completed an Analysis of BLM’s report on conduct at the Triple B roundup. Wild Horse Education is continuing in the Court system to fight for a Humane Care standard. After winning the first TRO in the history of the program to conduct the fight is heading back to Court. 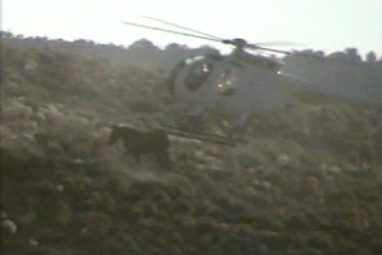 This action is currently supported solely by Wild Horse Education (WHE). Support it if you can and donate here.